Think I'm getting the hang of it. booo I got 9908/1024. I was sooo close to the 2048 tile. I just scored nearly 5000 just by pressing down-left-up-right over & over. I haven't figured out the luck to skill ratio in this game yet. There's definitely a little bit of skill involved with how you actually make the moves (for instance, if you have 3 or 4 of the same number in one spot, how you decide to move can make or break the rest of the board). Is the first score supposed to be a high or low number? Like I feel keeping it lower means less moves, no? The first score is the high score (like you get points for making the matches, and you get more points for higher numbered matches). Right. So the less matches the lower your score. The lower your score the quicker you got to where ever it was you were going. Rylan wrote: Right. So the less matches the lower your score. The lower your score the quicker you got to where ever it was you were going. This is what I am asking. 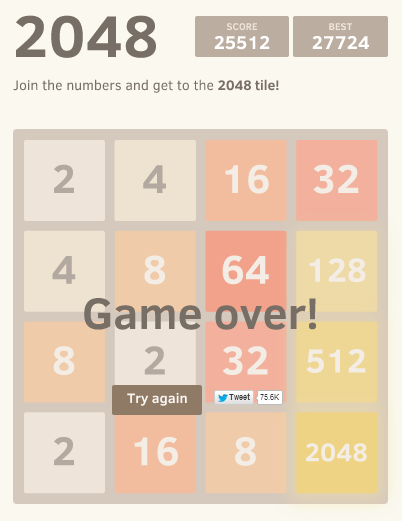 So after 2048 its conceivable that there is a 4096? I guess so. I kind of lost my system on one move and then it spiraled from there. I don't see a reason why it just can't keep going if you don't slip up.